One of the handful of USB 3.0 devices currently available: the new “SuperSpeed” port on a Verbatim hard drive. Photo (CC-BY-NC-ND) auxo.co.kr. “SuperSpeed USB” or USB 3.0 offers major forward advancement for hardware ins and outs, with faster throughput (yielding up to ten-fold speed gains over USB2), improved overall performance, and lower power consumption. That should be good news for music and motion users, who make heavy use of bandwidth for audio, storage, video, and other media applications. Real-world usage, though, has been scarce. The specification is nearly four years old, but extensive experimentation using USB 3.0 in the field has been limited largely to custom PC builders and those trying bleeding-edge machines. As part of the requirement, all USB 3.0 ports include the necessary pins and logic to process USB 2.0 signals, and all of the receptacles are physically compatible with their earlier counterparts. With support for USB 3.0 on the new Apples and other hardware, though, comes new chip sets. The computer isn’t the only element in the equation; you need support from third-party hardware, too, in the form of their firmware and computer drivers. And here’s the bad news. We’re already hearing from some users and readers that not all their gear is playing nicely with USB 3.0 ports. We’re awaiting more details from more vendors, but because some especially-enthusiastic Apple fans are going out and buying new MacBooks, it’s worth sharing some of this experience. With any new-generation computer hardware, it may be best to wait long enough to review any new compatibility issues before purchasing, if you’re looking to a machine that will go into mission-critical music service in live performance or a studio. In the long run, it’s fair to expect these issues will be ironed out, since we really are talking about USB2 signals sent over a USB3 bus. Update: Another significant difference may be power. We’ve seen issues with USB devices before involving even minor power differences. One reader wisely points out that incompatibility reports we’re seeing all seem to involve bus-powered devices. And this is an area in which the USB specification alone doesn’t provide enough certainty to rule out potential problems. Different bus-powered USB devices have different power draws, and may respond differently to power availability. If you are testing an audio gadget, this is an easy one: find a correct power adapter for your device, and try plugging it in rather than relying on USB alone. If that fixes your issue, we definitely want to hear about it. Here are some initial reports, as we gather more information. MOTU USB 2.0 audio and MIDI interfaces are indeed compatible with USB 3.0 on the latest Macs. We don’t recommend third-party USB 3.0 adapters, however, as results are less consistent there. We’ve heard other success stories, too, apparently owing to drivers. Now, onto some of the troubles. 1. At this point every Rain computer offers at least one USB 3.0 port. The new Element V2 (http://raincomputers.com/element-v2) offers five USB 3.0 which is the most of any Rain. We’re also going to release a new laptop which will be the first to have eSATA 3 (damn fast). 2. We’ve had some issues with USB 2.0 audio interfaces, DJ controllers, etc when plugged into USB 3.0 ports. Symptoms include stuttering, drop-outs, distortion, etc. That said, USB 2.0 has come an incredibly long way. As long as you have good drivers (like those from RME, Steinberg, etc) performance is great. I think the entire audio industry is waiting to see what happens with USB 3.0, Thunderbolt and eSATA 3. It will be one of those VHS vs. Beta things, no doubt. One thing is pretty obvious: FireWire is officially dead. Well, “dead” is a strong word if you’ve got working FireWire devices plugged into a computer, of course, but moving forward, I agree. More troubles: reader @SyntheticJuice on Twitter reports an M-Audio Axiom works without incident, but has trouble with hardware as varied as a Korg KP3 and Novation Launchpad. (Worse: in comments, we’re hearing problems with the Axiom Pro.) These may or may not relate to what’s happening on the new Apple, depending on whether the Windows PC and Mac in this case share the same chipsets, and what the culprit actually is. I thought this news would be of interest to your readers, and maybe give you a little schadenfreude as you’re always harping on waiting to update to the newest shiny until you’ve had confirmation from the audio vendors you rely on that their stuff works on the new platform :). So I bought one of the new Macbook Pro with Retina Display and besides one very annoying compatibility issue I am absolutely loving it. Compared to my pre-unibody Macbook Pro its replacing, this thing is blazing fast, and the screen really is as impressive as the tech press makes it out to be ( I have a 23″ LCD collecting dust because it looks worse than the 15″ screen on the laptop…never thought that would ever be the case). to the Mac as well. My guess is while the interface for class-compliant devices has been kept compatible, NI makes some low-level assumptions about the USB 2 protocol within its drivers that no longer holds up on a USB 3 port. I’ve opened a support ticket with NI to see what’s up, but I’m sending this to you to warn any of your readers that are looking to pull the trigger on one of these to be aware that their existing USB 2 audio interfaces might be currently incompatible with the all USB 3 current line of MacBooks. If you’re dependent on your existing USB 2 audio interface working out of the box, better hold off until your vendor has confirmed their drivers to be compatible! As we write this, we’re awaiting further word specifically from Native Instruments engineering on that case. But to be clear, this isn’t in the reports we have a problem exclusive to NI drivers. Some audio drivers are impacted; others are not. It’s unclear whether this is simply an issue with new, untested chipsets for support with USB 3.0, or an issue with device drivers, or firmware, or a combination of the three. Issues like this can occur even without adding something new like USB 3.0 to the mix. Implementing the USB specification is a non-trivial matter. When designing an interface, Apogee has had to choose between performance (PCIe) and convenience (USB, Firewire). Thunderbolt offers an interface protocol that is better than both of those words – a transfer rate that’s higher than PCIe, a connection that’s more robust and simple than USB3, and more wattage than Firewire (for powering devices). Thunderbolt is quite simply the perfect no-compromise format for the Mac-based digital audio interface. “Robust and simple” would be the key words there. It seems fair to assume we’ll see a mix of gear for these different formats; we’ll be watching and continuing to communicate with vendors to find out which buses they prefer. But in theory, the new Macs should support all of them – that is, once audio vendors work out some kinks with drivers. Consider this the first part of our coverage of USB 3.0. Whether you’re a Mac or Windows/Linux PC user, the availability of USB 3.0 on the popular Apple laptop line is sure to mean that manufacturers of audio gear are more likely to eye producing USB 3.0 devices as an option – and more likely to begin testing USB 3.0 with their existing USB product line. If you have hands-on reports of your own, we’d love to hear them. If you’re a manufacturer, do get in touch. And we’ll continue sharing reports as they come in. M-Audio USB devices are not qualified for use on USB 3.0 ports at this time. 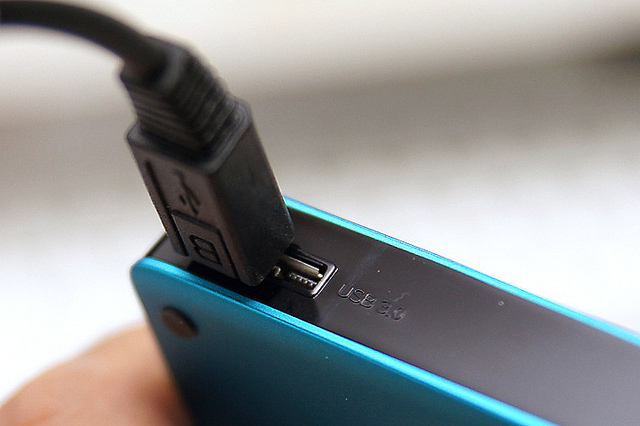 If you are experiencing problems such as pops, clicks, crackles, dropouts, and distortion, or if your device is not recognized or drops offline, make sure your device is connected to a USB 2.0 (or USB 1.1) port.